Dr. John D’Angelo Receives 2018 Leadership Award. Dr. John D’Angelo, Director of the Gary S. Horan Emergency Department at Trinitas Regional Medical Center, Receives 2018 Leadership Award. This year’s Lester Z. Lieberman Leadership Award for Humanism in Healthcare has been presented to Dr. John D’Angelo, emergency medicine specialist at Trinitas. Dr. D’Angelo believes that life’s journey should be about reaching beyond yourself in the work that you do. He sees both his life and his career as a balance of competition and caring: the competitive spirit that he got from watching his father navigate the high intensity atmosphere of the restaurant kitchen and from playing football in high school and college, and the caring and support that he received from his mother, who gave him the confidence to pursue his dreams. John worked in the family restaurant washing dishes, waiting tables, and later tending bar throughout his school career. He learned to thrive in that environment but put those skills to very different use thanks to the encouragement of a Jesuit priest who saw his love of children and urged him to become a pediatrician. Emergency medicine found him, Dr. D’Angelo explains, because it is so similar to the restaurant business: you work in a high energy, high stakes environment, meet people who are down and out, have rapid encounters, and immediately see the results of your work. Trinitas’ motto – “I see you, I am you” – is John’s as well. “Seeing yourself in your patients, struggling and rejoicing with them” is the reason he does this work. 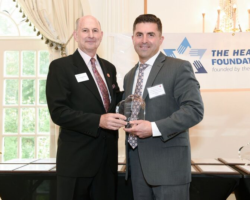 The Healthcare Foundation is proud and privileged to honor Dr. John D’Angelo and present him with its 2018 Lester Z. Lieberman Leadership Award for Humanism in Healthcare.